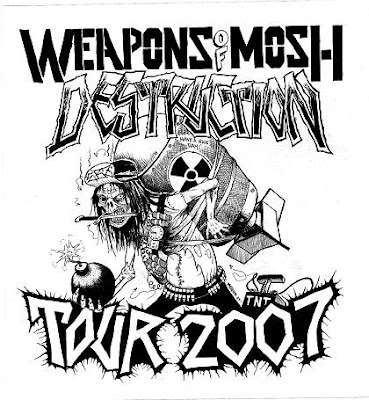 THE MOSH THAT TIME FORGOT! Here's my new shirt design for ENGORGED! You like dinosaurs? How about moshing dinosaurs??? 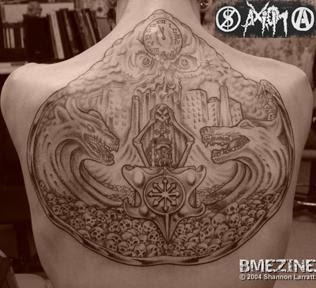 Here's a nice tattoo of one of my older drawings for Axiom. The original art is now in a private collection but can be viewed at my website here. Thanks to Joel for sending me this one! of Mythic and Demonic Christ! "...ignite in me the fire of the storming triple 6..."
At the Mutter Museum, Philadelphia, PA.
Drew Elliot, the man behind some of my favorite late 80's death metal record covers! He also created the Nachtmystium tour shirt and dealt with my drunken banter. All around nice guy. "THE PATH OF NO RETURN!" Legendary punk artist Fly in her studio. While I was in the Lower East Side I visited my old friend and former Antischism singer Brent "Arrow" Baker. Brent is currently a bio-diesel activist in the process of organizing a major bio-fuel factory that he hopes will one day serve the entire tri-state region. After hours at Duff's Alcohol Abuse Center in Williamsburg, Brooklyn. I parted ways with everyone in Brooklyn. We drank until the sun came up and stumbled out into the morning to snap this farewell photo. It was impossible to document all the insanity and allies encountered on the sleepless road but, needless to say, this tour exceeded my expectations on every level. Hail to all the friends I met, especially all the bands, and everyone who came out and said hello. and he'll have t-shirts available on the tour!